In November of 2010, we began our journey to Ugandan adoption. As we waited for a match, there were changes in international adoption laws and protocols for Uganda, which led us to pursue a very special child in 2014: a sweet and happy boy with profound deafness, cerebral palsy, cognitive delay, and swallowing dysfunction. At that time, he was 5 years old. God used so many circumstances to confirm to us that THIS was our child. We had no doubt that this was the one God led us to Uganda to pursue. As we prepared to bring him to our family, his case came to a screeching halt and we were told that the match fell through. We were devastated, but remained in contact so we could continue to be a part of his journey. We kept our adoption paperwork updated, which was costly but turned out to be worth it. Because, in March 2016, we were given the chance to try again to adopt our boy! He was still without a forever family. He is now 7 years old! 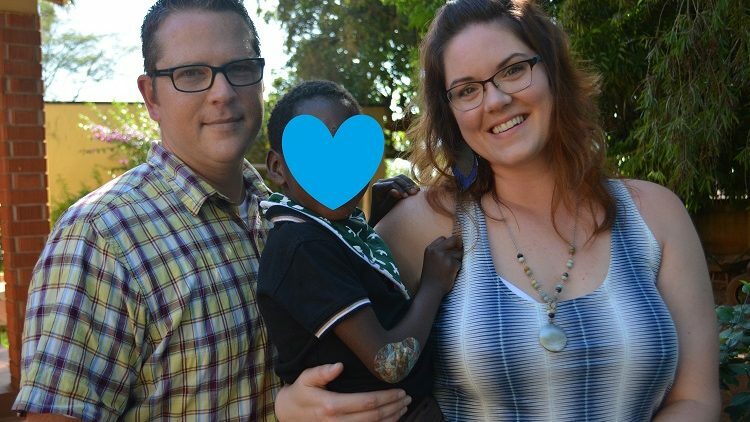 Within 24 hours of our decision to "try again", we got word that Ugandan law had significantly changed to make international adoption even more difficult! We worked for 6 months to try to sort out how to bring our little guy home to no avail- we could not get a clear understanding of how to proceed, and the group in charge of his case in Uganda wasn't communicating with us. Some people even said that it would be virtually impossible to bring him to our family. In November 2016, we went to Uganda to initiate meetings with the decision makers in his case, and traveled to Uganda purely by faith. Our decision to go to Uganda, with no clear specific plan, was purely out of obedience to the Lord. While we were afraid, we also knew that God had a perfect plan and would lead us to the right people. In a matter of 10 days, God miraculously moved mountains and linked us up with the most important decision makers for our son. In the last week, have learned that we have full consent to adopt him, and are expecting a court date in January 2017 to FINALLY bring our son home. This entire journey has been in faith, God has provided the funds for every step of the way. We know that God's plan is to bring this child home so he can become a Wickey forever. Our final steps to bring him home are in front of us, and they are the most costly steps we have encountered: we have been asked to bring our entire family to appear in court in Uganda, and plan to stay in country for at least 2 weeks. The travel alone is very expensive! Our children still need passports and vaccinations, too! When it's all added up, conservative costs to finish this process will be $15,000-$20,000. We know that God can make a way where there seems to be no way! So excited for you on this adventure! May God give you the grace, patience, wisdom, and peace you need! What a miracle! God is good! I can barely see through my tears to type this. God is good! I am so happy for y'all! Love you! This is good work. Can't wait to meet your new son! I am so happy for you and Isaiah! Praying for the Holy Spirit to surround him, keep him, heal him, and bring him safely home to his new family. I'm so happy for you guys... I don't know you that well but what you guys are doing is amazing. Hope this becomes a reality soon!!! He will be one lucky boy!!! Praying for a speedy settlement! I pray for blessings for your family throughout this journey. You are amazing people, and there is no one more deserving to have this happen for them. The Horns are praying with you and for you! It is a pleasure to be able to help with this adoption! We want to congradulate you on the new addition to your family! God bless you all! God blessed us with a miracle, so hopefully this helps bring your miracle to you!